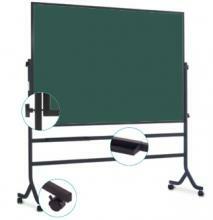 Economy Easel Chalkboard with Powder-Coated Steel Frame. This double-sided chalkboard rotates and locks into place on a powder-coated steel easel. The rolling easel frame sits on locking casters, providing increased mobility. An extra-wite chalkboard accessory tray is included. Choose your chalkboard size and easel color.